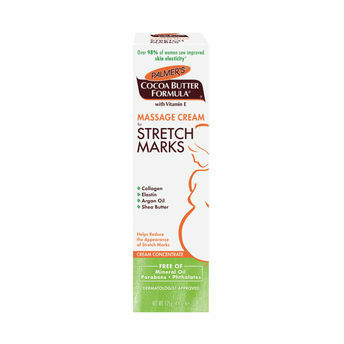 Palmer's Cocoa Butter Formula Massage Lotion for Stretch Marks helps reduce the appearance of stretch marks. An all-over-body massage lotion specifically designed for pregnancy stretch marks. It is enriched with pure Cocoa Butter, Vitamin E, Shea Butter and Bio-Elast. Palmers Cocoa Butter formula Massage Lotion Stretch Marks hydrates the skin; helping the epidermis to maintain its natural elasticity and helping to prevent the tears which appear as stretch marks. This dermatologically tested lotion can also help to relieve the dryness associated with stretched skin due to pregnancy.